We’d love your help. Let us know what’s wrong with this preview of Posted To Death by Dean A. James. Edgar nominee and Agatha Award-winner Dean James offers his own delightful take on a classic British cozy mystery...starring an attractive, sophisticated man who just happens to be a vampire! England has found itself a new sleuth to call its own, but Simon Kirby-Jones is not only a vampire, he's an American to boot. He's pulled up stakes in the States to settle in the quain Edgar nominee and Agatha Award-winner Dean James offers his own delightful take on a classic British cozy mystery...starring an attractive, sophisticated man who just happens to be a vampire! To ask other readers questions about Posted To Death, please sign up. Persons in the mood for absurd fluff might add another star -- I was and I almost did, but I wouldn't want to mislead. We are not looking at Dorothy-Sayers depths of characterization, setting, or theme, here. And also its three sequels, because I was in the mood for fluff, to wit, Faked to Death, Decorated to Death, and Baked to Death, in that order. Readers following the romance-of-sorts will want to take them chronologically. I swear this book/series must have started with either a dare or a bet Persons in the mood for absurd fluff might add another star -- I was and I almost did, but I wouldn't want to mislead. We are not looking at Dorothy-Sayers depths of characterization, setting, or theme, here. I swear this book/series must have started with either a dare or a bet on the part of the author. All the tropes of the cozy mystery genre piled atop one another till they threatened to topple over, yet didn't, quite. Gay Southern recent-vampire (but relieved of all the less appetizing parts of his new state by modern medication) academic writer moves to a cozy English village, there to encounter quirky people and cozy English murders, ad lib. The second volume, Faked to Death, takes place at a writers' conference, adding special amusement for me. Quick reads. I grinned out loud in several places. What's not to love about that opening sentence? I just knew it was going to be a hilarious story and I was right!! Someone has murdered the village busy body and Dr Simon Kirby-Jones is on the case!! And using all his detecting abilities to solve the crime. Alas he developed his detecting abilities through writing murder mysteries but he doesn't let his lack of investigative skills deter him. And so he seeks to find out who dunnit and why, and along the way he gets to discover the ins and outs of village life, village love, village mysteries and villagers pasts. Snupperton Mumsley might be a peaceful looking village on the surface with its vicar, ancient church, committees, fetes and village life but what lies beneath? I enjoyed this. The main character, Dr Kirby-Jones, narrates the story and provides a humorous insight into the people that live in the village. As he settles into village life we get to see what it takes to be a vampire sleuth and how not to upset the vicar. This is a lovely book, set in a very British village with British humour, albeit from an American vampire, but that just provides an additional dimension of funny. I really enjoyed this first book in the series it is catchy and engrossing from the word go, right up to the end and provides enough of a back story so that we quickly become familiar with Simon, his past and how he became a vampire living in an English village. The story has some very amusing supporting characters and the mystery isn't revealed too soon. In fact it kept me guessing for quite a while and I got it wrong in the end. Normally I get it right and so this delighted me because I read a lot of mysteries but this time I didn't see the end coming. This is book one in the series and I definitely intend to read the others. As a cozy mystery, this one is pretty neat ... and very British *lol*. I mean, the names like Prunella Blitherington, Neville and Letty Butler-Melville, Snupperton Mumsley ... can't get any more British-tone than that!! The whole 'secrets' within the English small town reminds me of one of Agatha Christie's novels, Murder at the Vicarage, that I read LONG time ago when I was probably still in my late Elementary / early Junior High School. It is intriguing :). The writing feels a bit too formal a As a cozy mystery, this one is pretty neat ... and very British *lol*. I mean, the names like Prunella Blitherington, Neville and Letty Butler-Melville, Snupperton Mumsley ... can't get any more British-tone than that!! The whole 'secrets' within the English small town reminds me of one of Agatha Christie's novels, Murder at the Vicarage, that I read LONG time ago when I was probably still in my late Elementary / early Junior High School. It is intriguing :). The writing feels a bit too formal and a little bit out-dated though (to me personally, anyway). Because of that when I see 'contemporary' terms like DNA, it takes me out of the story a little bit. It's a little bit weird to read. I absolutely have no idea why Simon is written as a vampire. What's good of Simon being a vampire, if he doesn't really 'act' or 'have' common vampire traits due to the miracle pills that he consumes? The only vampirism that Simon retains is his aversion to garlic. Sure, being a vampire makes him having a super hearing ability, but I'm sure the author can create another device to help that. His being a vampire really doesn't add anything to the story. I may return but right now I'm not interested in finishing. I love cosy-mysteries add some quirky humour and the opening lines attracted me moth to lamp. Unfortunately the characters aren't likeable. The appeal of these stories is often the cast, likeable in their eccentricities, odious in ways that promise comeuppance. Here there was a pettiness that overrode charm. Not entirely sure why Vampires in this setting, all it adds is a connection with one inhabitant that could have been engineered in a I may return but right now I'm not interested in finishing. I love cosy-mysteries add some quirky humour and the opening lines attracted me moth to lamp. Not entirely sure why Vampires in this setting, all it adds is a connection with one inhabitant that could have been engineered in any number of other ways. The self-satisfied nature of Simon Kirby-Jones felt like a sneer and it stopped me connecting and relating to his narration. I became tired of him before halfway through the book and didn't find anyone else to care about. I loved this series of four very funny mysteries. The nain character is sort if a male Miss Marple. He lives in a small cottage in a small English village with a weird name, and every time he turns around, he finds a dead body - and solves the mystery. That's where the similarity ends. Simon Kerby-Jones is male, he's a well known historian and he's gay. He's also got a few secrets. One is that he writes novels under two female names. The other is that he is a 'new vampire'. They have these little wh I loved this series of four very funny mysteries. They have these little white pills that they take three times a day which keeps them from having to drink blood; allows them to be out in the sun as long as they wear hats, sunsceeen and sun glasses, and live fairly normal lives. They also deprive the vampires of some of their old powers - the Glamor, shape shifting, and those fun stuff. Simon also has put himself in a dangerous situation. He's hired the local "baronet" - a hot young man who is the 'lord of the manor", to be his assistant - and the stud turns out not to just be gay, but have a case of extreme hots for our vampire - who feels the same way. But he can't risk Sir Giles finding out that he's a vampire, so he resists. At the same time, the local police detective - who Simon keeps bumping into because of his habit of finding dead people - is an attractive man who flirts with Simon - but is he gay? After I read the series from the library, I was lucky enough to find all four books on sale in a local dollar store - in hard cover. Guess what everyone I knew got for presents that year?? Posted to death is, in this case a book being posted to death :D. It is making its way around some of my friends on Risi and started out in the USA. So far it has travelled 6230 miles (unpon getting to me) and will be heading to England I believe next. It is a fabulous non challenging wee read and for me I was sold with "it has a gay vampire in it", I do love vampire books and this is a first for me. Simon Kirby-Jones is our star and author himself, he moves to a wee village in England. Filled wi Posted to death is, in this case a book being posted to death :D. It is making its way around some of my friends on Risi and started out in the USA. So far it has travelled 6230 miles (unpon getting to me) and will be heading to England I believe next. It is a fabulous non challenging wee read and for me I was sold with "it has a gay vampire in it", I do love vampire books and this is a first for me. Simon Kirby-Jones is our star and author himself, he moves to a wee village in England. Filled with busy bodies and all the other antics of a small close knit town Simon finds himself surrounded by drama of all kinds. With the threat of an expose play based on the village peoples secrets a murder occurs and the book is basically about finding out who done it and revealing the characters of the village (and the secrets they would rather keep quiet). I started reading this series thinking that I would be putting it down and returning it to the library before I could finish the first chapter. So far the other few books written about vampires have been beyond a bore to me so this book would have to prove itself and fast for me to get to the end. Let me just say this lovely romp in merry old England with Simon Kirby-Jones has done more than I could have imagined. I enjoyed the imagination of Dean James in writing this book. The fun characters and his whimsical way of entertaining the reader. The originality of Simon and his updated vampirical lifestyle. I can only give this book the highest recommendation for all cozy mystery lovers out there. One of the best and most fun books ever! Update: Who am I kidding? I'm never going to finish this book. A gay-vampire-cozy-mystery sounded better than it's turning out to be. Most of the gimmicky named villagers of the gimmicky named village of Snupperton Mumsley (aka suspects) are generally petty and pompous rather than interesting and eccentric. And we don't care much for the mean-spirited victim either. Since amateur detective Simon Kirby-Jones is taking vampire-control pills, his undead state is pretty much irrelevant to the plot. Update: Who am I kidding? I'm never going to finish this book. Since amateur detective Simon Kirby-Jones is taking vampire-control pills, his undead state is pretty much irrelevant to the plot. And except for some leering and a little nudge nudge wink wink, his sexual preference is pretty much irrelevant, too. He is more Miss Marple than Stephanie Plumb. This was disappointing. The concept sounded good - I love British mysteries, especially ones set in the countryside. However, the writing let this down. There were too many cases of names being used in dialogue, which I find jarring, i.e. the characters referring to each other by name throughout their conversations. I didn't feel a connection to the main character, either. The plot was interesting enough to keep me reading, but the ending felt a little flat. Gay vampire mystery novel. Sounds like a "what's not to love?" right? Wrong. This was a big dud. This is a good place to say, too, that I'm really tired of authors who write about vampires, but write characters who are almost unrecognizable as vampires. It's like they want to jump on the vampire bandwagon, but don't want to be inconvenienced by the conventions. My review probably won't carry much weight, as I couldn't finish the book. The story was humorous and I liked the mystery, but ultimately I didn't really care about the characters or what happened. I can't entirely explain why, but I didn't care for this book. That being said, for those who do enjoy humorous, silly-at-times mysteries, you'll probably like this one. Amusing, 'cozy' mystery story. Kept me up into the wee small hours to finish it. Now need to track down the rest of the series. Cozy mystery with gay vampire — Ije liked it, just $.99 worth to try. A modern day Miss Marple. If Miss Marple were male, gay and a vampire. And a writer. So, in other words, not a thing like Miss M. Except for the setting - good old-fashioned English village where murder occurs. Anyway, the story was quirky and fun with a killer that I didn't figure out until around 2/3 through the book. (At least it wasn't like that one 'mystery' that I knew who the killer was before the murder had even happened. ... Don't ask.) Simon is likable enough, if a bit of a dunderhead A modern day Miss Marple. If Miss Marple were male, gay and a vampire. And a writer. So, in other words, not a thing like Miss M. Except for the setting - good old-fashioned English village where murder occurs. Anyway, the story was quirky and fun with a killer that I didn't figure out until around 2/3 through the book. (At least it wasn't like that one 'mystery' that I knew who the killer was before the murder had even happened. ... Don't ask.) Simon is likable enough, if a bit of a dunderhead at times. (The nicest thing for me was seeing LGBT+ diversity in a mystery where the diversity wasn't solely the killer and/or victim.) Short, fun and rather silly - exactly what I wanted to read. Within the first few lines, we learn the narrator is gay, a vampire, and has the hots for the local vicar. I have no issues with gay characters, vampires, or gay vampires. The Anne Rice books were great reads. I gave up on the first page. I was already bored. Dean A James is no Anne Rice. That said, I'm sure many folks will enjoy this greatly. Posted to Death is a story of an American gay vampire who moves into a small village in Snupperton Mumsley England. The post mistress has been murdered and the story revolves around the "who dunnit" atmosphere. This was a quick easy read although not overly exciting but at times interesting. I read this ages ago. Luckily for me, googling "cozy mystery gay vampire" turns it right up. It was still amusing this time around. Some of the attitudes on sexuality and gender don't stand up as time has passed, though. I'm going to try another. Just really good fun. Lovely subject matter, lovely hero, just fun. This mystery was funny, quirky and had lots of twists and turns! Looking forward to reading the next one! I like this better than The Cat in the Stacks series - wittier, more sophisticated writing. I had a blast reading this book. It's a series I can get into and definitely will do so very soon. 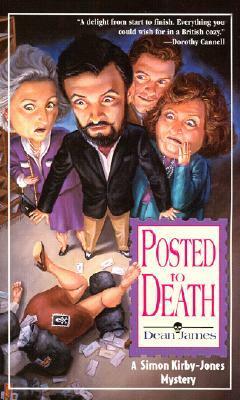 Posted To Death is a fun, cozy mystery that keeps you guessing almost to the end. It's definitely different to have the hero as a gay vampire (although the vampire aspect isn't the main focus here, so don't think, "Oh no! Not another vampire story!"). Simon, the gay American vampire, writes biographies under his own name and writes steamy, gossipy fiction under a pseudonym. He has moved to a small English community that is inordinately LGBT (and yes, the story does have a transgender/transexual c Posted To Death is a fun, cozy mystery that keeps you guessing almost to the end. It's definitely different to have the hero as a gay vampire (although the vampire aspect isn't the main focus here, so don't think, "Oh no! Not another vampire story!"). Simon, the gay American vampire, writes biographies under his own name and writes steamy, gossipy fiction under a pseudonym. He has moved to a small English community that is inordinately LGBT (and yes, the story does have a transgender/transexual character). None of this is out of the ordinary in 2017; however, this diverse characterization was no doubt a bit different 15 years ago when this was published. The writing is quite snappy, and the plot is quick. The characters are fun (some are quite lascivious) and harbor many secrets. Posted To Death is an interesting spin on a classic Whodunit. The plot had many surprising twists and turns I never thought of, was suspenseful and humorous at the same time. The life in a small village with all the undercurrents and everybody knows everything about the others like it is usual in small communities is described in an enjoyable way. But I think the aspect of Simon being a vampire was missed out if he had been just a human I don´t think it would have made so much difference to the story. It was a light and amusing book and I´m sure I will continue reading the next installment "Faked to Death" some time in the future. I found this whole series of "cozies" by Dean James to be highly entertaining. I can't remember how I first discovered this one, the first in the series, but I couldn't wait until each of the next three were released. Of course they're a bit on the silly side, but that's the whole fun of the cozy mystery genre. The set-up and cast of characters reminded me very much of Anne Fraser's fiction, but a bit more light-hearted. They're also very reminiscent of Midsomer Murders, a series to which I am u I found this whole series of "cozies" by Dean James to be highly entertaining. I can't remember how I first discovered this one, the first in the series, but I couldn't wait until each of the next three were released. Of course they're a bit on the silly side, but that's the whole fun of the cozy mystery genre. The set-up and cast of characters reminded me very much of Anne Fraser's fiction, but a bit more light-hearted. They're also very reminiscent of Midsomer Murders, a series to which I am utterly addicted. Simon Kirby-Jones is an American historian and professional writer who has emigrated to the quirky small English village of Snupperton Mumsley after his "sire" gives him a cottage there. With his vampiric disadvantages controlled by medication--thanks to a global vampire underground which is only peripheral to the story--he doesn't need to chow down on the neighbors and is able to stroll about in the daytime, although he spends his nights working hard at his keyboard. Simon is a very disciplined writer with both fiction and nonfiction to his credit under several different names. In this first book of the series, Simon becomes involved in the mysterious death of the local postmistress, who, it turns out, had been been less than respectful of confidentiality. He also discovers that he may not be the only vampire in the village. Simon is a gay vampire novelist who happens to stumble upon a mystery. Simon is an extremely likable fellow that carries us through the light and fluffy mystery. Pros: It doesn't hurt, physically speaking. It's been a long time since I was able to pluck a random book off the shelf and not receive a headache in return, Posted to Death is a nice change of pace. In addition, the mystery isn't predictable, another nice relief from modern lore. The writing is quipy and strong while maintaining a light Simon is a gay vampire novelist who happens to stumble upon a mystery. Simon is an extremely likable fellow that carries us through the light and fluffy mystery. Pros: It doesn't hurt, physically speaking. It's been a long time since I was able to pluck a random book off the shelf and not receive a headache in return, Posted to Death is a nice change of pace. In addition, the mystery isn't predictable, another nice relief from modern lore. The writing is quipy and strong while maintaining a light-hearted air. It's almost as if the novel doesn't take itself seriously, allowing the reader to invest as much as they'd like. In addition the protagonist is gay and no one makes a big deal out of it, more fresh air kindly provided by this read. Cons: As I learned from my husband, the language will not suite everyone. Dean James often uses "big words" that can distract readers who tend to stray from higher reading level books. Plot wise, beware the vampric promise, Simon takes pills that vito the negative effects. The vamprism is basically a device used to increase Simon's powers, and though its well-used when used, it is basically pointless.